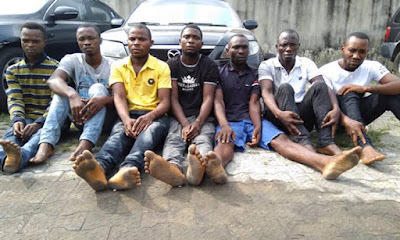 Seven suspected members of a notorious gang have been arrested for allegedly abducting an Assistant Comptroller of Customs, Justina Tanko, and killing a businessman, Chukwubuikem Ezenkwu. The men, identified as Godspower Keenom, alias Imotar; Zigabari Voonu, Oludofin Yakubu, Justice Afangide, Dale Keliaga, Maxwell Barindom and Tordi Barinaa, were rounded up by operatives of the Inspector General of Police Special Intelligence Response Team. The suspects were rounded up in the Onne area of Rivers State. About N5m ransom had been allegedly paid for the release of the customs officer before the suspects were arrested by the police team led by Deputy Commissioner of Police, Abba Kyari. The businessman was killed and his corpse dumped in a river after the kidnappers allegedly collected N2.5m ransom from his family without releasing him.